Some residents of Jakarta, prefer a vacation out of town or go to the mall, to spend their weekend. But in a fact, Jakarta itself has a lot of tourist destinations, which in addition to very unique also fairly cheap. Just like the tourist objects with a religious theme. Besides, don't need to spend a lot of money, this places can also make our soul become more peaceful. And for those of you who are curious about the objects of religion-themed tourist attractions in Jakarta, then you should read this article to complete. Because in this article, we will discuss about some religious-themed attractions, that located in the Jakarta City. 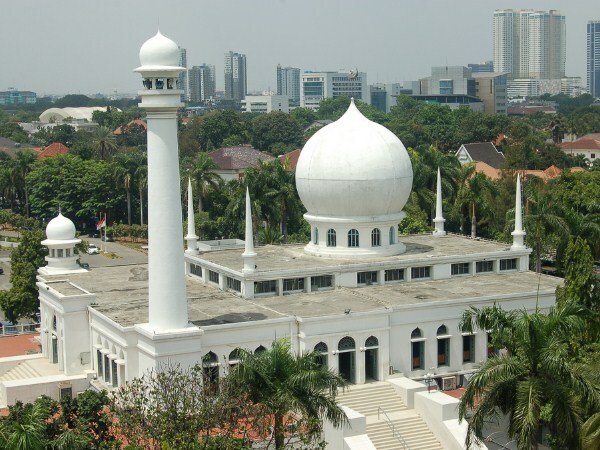 Jakarta Islamic Center or often called JIC is located in Koja, North Jakarta. JIC is a place of development and learning about Islam. As a place to development and learning about Islam, JIC is equipped with a library containing books for learning about the history of Islam. Istiqlal Mosque is located in Pasar Baru, Sawah Besar, Central Jakarta. This mosque is very popular, both for residents of Jakarta and for residents outside Jakarta. The Istiqlal Mosque means the Merdeka Mosque. 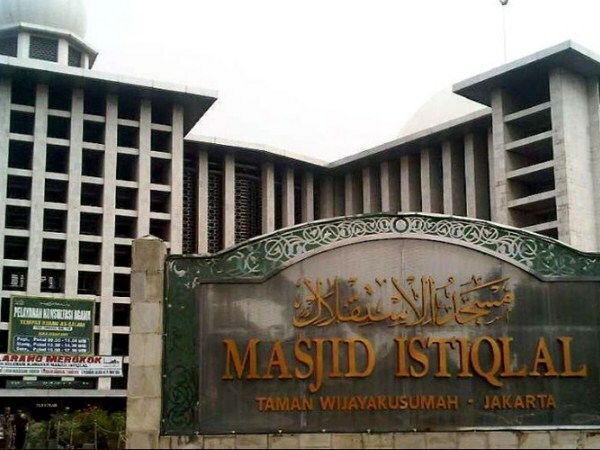 The area of Istiqlal Mosque is about 9.5 hectares, which can accommodate over 200,000 people. 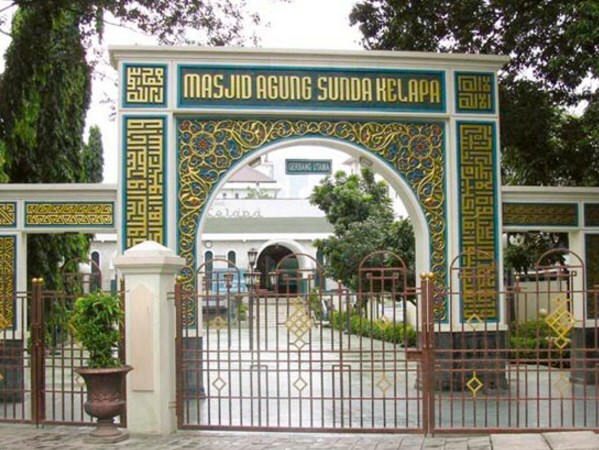 Sunda Kelapa Great Mosque is located in Menteng, Central Jakarta. 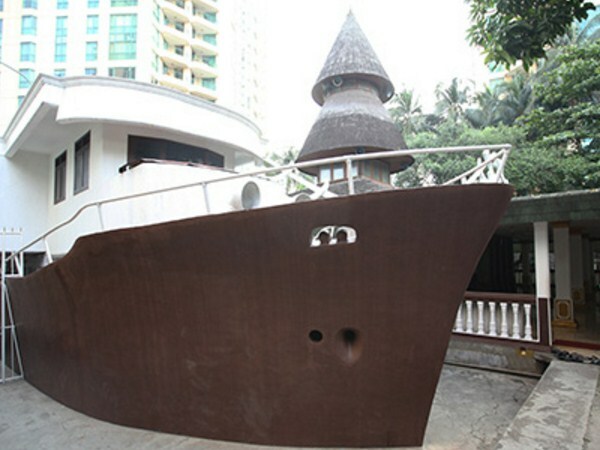 The building of this mosque is similar to a boat. And is a symbol of the Port of Sunda Kelapa, which in the past became the place of a Muslim merchant spread Islamic Shari'a, and also doing a trade. Al-Azhar Grand Mosque is located in Selong, Kebayoran Baru, South Jakarta. The building of this mosque which was confirmed by the Jakarta Administration as one of the 18 historical development sites of Jakarta city, was made with a blend of the architectural style of Hij 'Mosque in Saudi Arabia and Qibtiyah Mosque in Egypt. 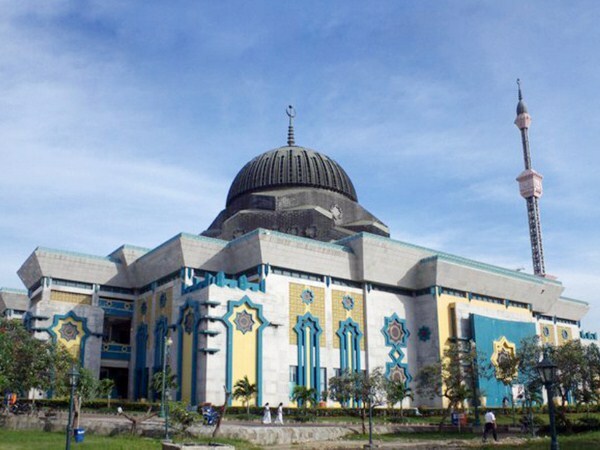 Since 1967 the mosque has established formal education institutions, ranging from TKIA, SDIA, SMPIA, SMAIA, until finally founded Al-Azhar University of Indonesia. Masjid Perahu is located in Menteng Dalam, South Jakarta. The boat that contained in the mosque is used as a place for ablution (wudhu), before doing Sholat. According to Imam Masjid Perahu, the boat was a symbolizes of Prophet Noah history. Jakarta Cathedral Church is located in Pasar Baru, Sawah Besar, Central Jakarta. 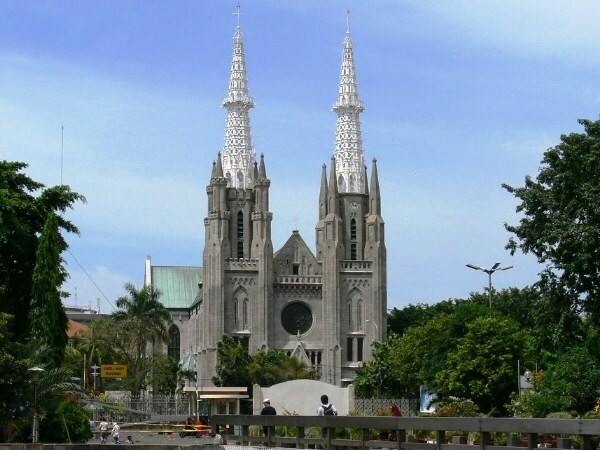 It is the oldest Catholic church in Jakarta, that built in 1901 with a neo-gothic architectural style, just like as churches that can be found in mainland of Europe. In this church, there is a museum that contains about 400 collections of goods. The museum in this church is complete enough to explain the Catholic tradition. 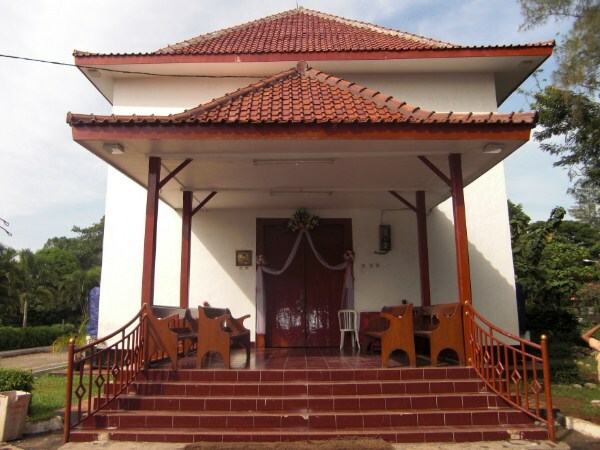 Tugu Church is located in Semper Barat, Cilincing, North Jakarta. This old building is a Portuguese heritage that had occupied Indonesia. This church was built in 1740. Inside this church, there are some relics of history, which is still complete and also still intact since the Portuguese era. Vihara Dharma Bhakti is located in Glodok, Tamansari, West Jakarta. This Buddhist place of worship also became a popular religious tourism spot. This is because, this monastery is the oldest monastery in Jakarta, which is about 740 years old. This monastery was built in 1650, by a Chinese Lieutenant named Kwee Hoen. 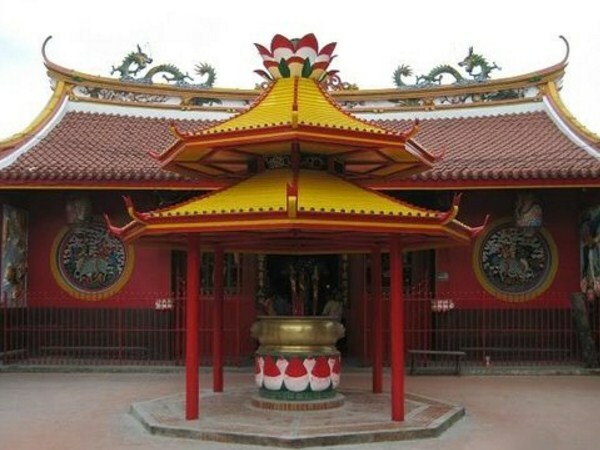 Vihara Dharma Bhakti is known as the center of Chinese festivals celebration. 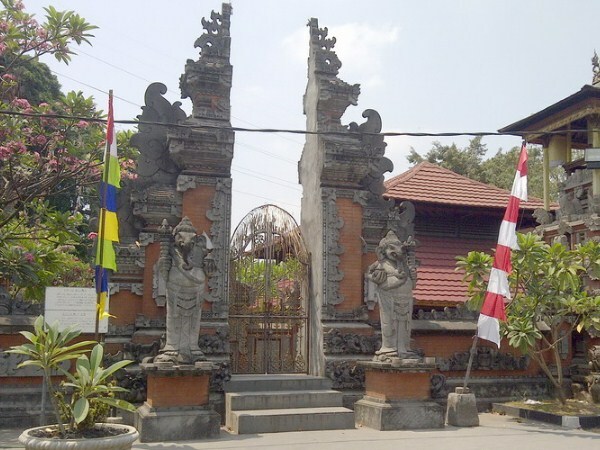 Aditya Jaya Temple is located in Rawamangun, Pulo Gadung, East Jakarta. It is the largest Hindu temple in Jakarta. The ornament of this place is typical Balinese style. The fascinating statue in this Pura Aditya Jaya is the statue of Goddess Saraswati, who is the wife of Lord Brahma. That's the 9 religious sights that you can visit in Jakarta. In addition to being an alternative tourist attraction that you can visit, these religious theme attractions can also give us further understanding, about the development of a religion that we profess. Remember to always maintain cleanliness in the tourist places that you've visited.